Life Span - 25 years. The Superb Parrot (Polytelis swainsonii) is also known as Barraband's or Barraband's Parakeet, which leads to easy confusion with the Orange-cheeked Parrots (Gypopsitta barrabandi aurantiigena), which is also commonly referred to as Barraband's Parrot. Another name this parrot is known for is the Green Leek Parrot -- this name applies to several unrelated species. This species was first described by French naturalist Desmarest in 1826. Its closest relative is the Regent Parrot. Superb Parrots spend a lot of time on the ground foraging for food; therefore they need to be wormed regularly. They are also susceptible to foot problems and eye infections. As far as pet potential is concerned - the males of these species are generally better suited than females. Captive Superb Parrots should be provided with a balanced diet of grains, seeds, nuts, fresh fruits and vegetables. In the wild, their diet consists mainly of eucalypt flowers, various fruits, nectar, pollen, seeds and plant matter. In the wild, Superb Parrots nest on hollow tree limbs or in the holes of trees. Pairs may nest in a loose colonial system of as many as 6 pairs. Males perform courtship displays to attract females. These nuptial displays include raising head and feathers slightly and staring at her with contracted pupils. During breeding season, small flocks of males often forage for food alone, and then return to the nest to feed their females and any young. In the United States, they usually begin breeding in March. In Australia: September lasting until December . They may produce up to two clutches a year, each clutch averaging four to six eggs which are incubated for 20 - 22 days. The best breeding results are achieved when Superb Parrots are housed as a single pair in an aviary approximately four to six meters long and one to two meters wide. A much larger aviary is required if these birds are to be bred using the colony system. 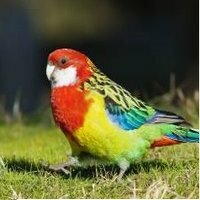 Superb Parrots have been known to have a breeding life of up to twenty years when kept in peak condition. They require a nesting box (cockatiel or lovebird-sized works fine) or hollow log of at least 8 inches (20 centimeters) in diameter. In the wild, they nest on hollow limbs or tree holes. Soft insect food is often fed to the adults to help them feed their young. The chicks fledge from 35 to 45 days and are independent by 50 days. Immature Superb Parrots have similar coloring to the females, but have brown irises, and they acquire their adult coloration when they are six to ten months old. Females are sexually mature at one year of age and males at two years.